Port Gregory (now known as Gregory) is a tiny settlement where convict history, fishing, wheat lands and ‘getting away from it all’ holidaying all mingle. It is an unusual setting. Wheat fields grow next to huge white sand dunes, an historic convict settlement stands on the shores of a pink lake, and a reef runs parallel to the coast forming a natural breakwater for a small harbour. This tiny village is a sleepy fishing port which is made very special by beautiful white sand dunes which are 10–15 metres high, a remarkable pink lake and some of the most interesting, and well preserved, convict ruins anywhere in Western Australia. 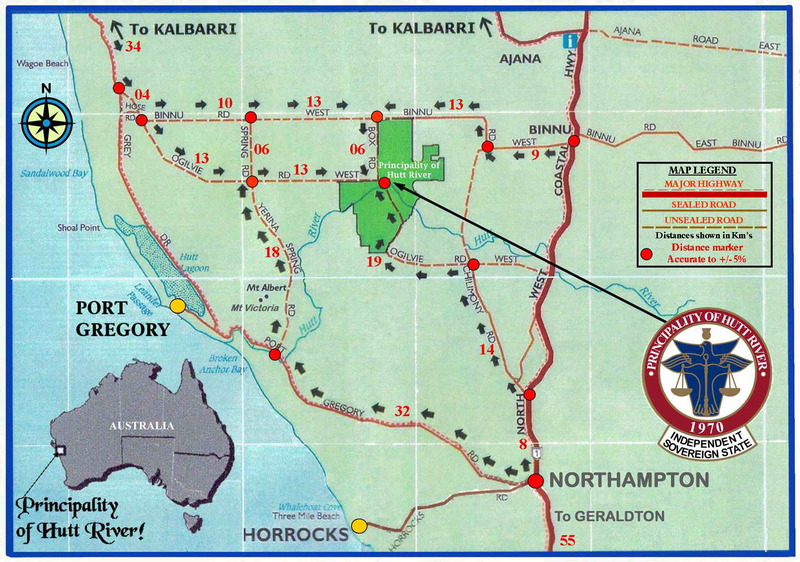 Port Gregory is located 513 km north of Perth via Jurien Bay and Geraldon and 48 km north west of Northampton. In 1848 the explorer A.C. (Augustus) Gregory discovered lead ore in the Murchison River. The port was named after both him and his explorer brother F.T. (Frank) Gregory in 1849. The Lynton Heritage Site, which is located just off the main Port Gregory Road before you pass the Pink Lake, includes 14 places of interest at "the only remaining site ... of a convict hiring depot which was laid out and functioning in the 1850s in Western Australia." It is a superb opportunity to learn about convict life in Western Australia although the Convict Hiring Depot only lasted from 1853-1856. Each building has a very detailed information board and the ruins are spread from the Depot Information Centre, which is near most of the buildings, across to Captain Sanford's Homestead which is 800 metres from the main Hiring Depot. The Hiring Depot was where convicts were held until local farmers came to hire them for labouring tasks. There are stories that the local farmers treated the convicts like slaves frequently flogging them for the slightest misdemeanours and summarily executing them for minor offences. It is hard to substantiate these claims and they may well be little more than local folklore. By 1856 a store, bakery, depot, lockup, hospital, lime kiln and administration block had all been built but a lack of fresh vegetables had seen the convict population ravaged by scurvy. It was decided to close the settlement and by January 1857 (less than 4 years after they had arrived) the convicts were either being shipped back to Fremantle or settled in nearby Greenough. There is an outstanding, a very detailed account of the Hiring Station and the community by Martin Gibbs titled Lynton: convicts, landscape and colonisation strategies in midwest Western Australia. Check out http://www.asha.org.au/pdf/australasian_historical_archaeology/25_04_Gibbs.pdf. 1. Depot - Interpretation Centre- now the Interpretation Centre this Depot was built in 1856. It was 17 m x 9 m and was designed to accommodate 80 men (on a double row of hammocks) who had previously being sleeping under canvas. 2. Officers Quarters- These comprised two dwellings - one occupied by the Officer-in-Charge and the other by a Non-Commissioned Officer. Each measured 5 m x 4 m and was under the same roof with low lean-to areas at the rear. Low stone walls were erected front and back creating private space or garden. 3. Commissariat- was made of stone with a shingled roof and was 8.4 m x 3.6 m.
4. Hospital- was completed in September, 1855. It measured 10 m x 5.5 m and was used for convicts, mine workers, guards, settlers and the families of these people. A medical officer, Joseph Horrocks, was stationed at the depot. Many of the illnesses related to poor diet and a lack of vegetables and fruit. 5. Bake House- it was built in 1855 with the baker's oven forming the core of the building. 6. Lime Kiln- "Erected on sloping ground, the kiln was loaded at the top with limestone. A fire was fed from the base. Lime, derived from burning the rock, provided mortar and limewash for all the buildings and hence it was one of the first structurres built." 7. Lock Up- this was used for short-term imprisonment or for those who were being shipped out to Fremantle. It was 1.2 m x 2.2 m.
8. Well- "constructed of rubble limestone, the well measured 1.3 metres in diameter. It was originally sunk to a depth of 18 metres but the water was brackish and another well was built on the banks of the Hutt River." 9. Magistrate's Quarters- "Following Sanford's resignation as Assistant Superintendent in 1854, the Resident Magistrate for the Victoria District, William Burges, was required to relocate to Lynton where he was temporarily accommodated in the Commissariat until the magistrate's quarters were completed. 10. Blacksmith's Shop- was completed in May 1855 and measured 5.9 m x 4.6 m. There was not always a blacksmith present at the depot and Francis Pearson, a resident of Lynton, was called upon to do blacksmithing duties. 11. Graveyard- the graveyard lies between the Depot and Sanford's Homestead. A single acre was set aside for the graveyard and a church but the church was never built. There were ten or eleven burials in the graveyard including five month old Mary Henshaw, her eleven month old brother James, children of Corporal Henshaw, and Frances Doran, wife of Captain Doran, who died in childbirth. 12. Lynton Barn- in the barn which is now part of the camping facilities below Sanford's Homestead, is a fascinating story about Anna Leonowens, who became governess to the wives and 82 children of the King of Siam, one of the residents of Lynton. 13. Lynton Mill- constructed below Sanford's House this was the flour mill for the entire community. Captain Sanford's Homestead was built by the convicts in 1853 out of limestone. A veranda was subsequently added with masts salvaged from the wreck of the Mary Queen of Scotswhich ran aground at Archdeacon Ledge in March 1855. Sanford, the grandson of the Duke of Bedford, was appointed Superintendent of Convicts in late 1852 but resigned in 1854. The house and outbuildings including a stone mill and large stone barn were all built during his period as Superintendent. The Western Australian State Heritage site notes of the building: "Sanford's imposing two storey residence sits on the side of a hill closer to the coast than the hiring station. The lower floor, with kitchen and possible servant's rooms is cut into the side of the hill so that the rear of the upper floor is virtually at ground level. Originally the house had large veranda/balconies across the front which had collapsed and been removed. Recently grants have helped fund a restoration programme which has seen the limestone walls stabilised, the roof reinstated and the veranda/balconies replaced. The homestead has several significant stone out buildings These include a well-proportioned barn, still in good condition through having enjoyed a continuing useful life, and a stone flour mill which has been re-roofed and restored in recent years. Down towards the convict hiring depot, under the shade of a tree, is a small cemetery with three graves including two children's graves. Unfortunately the headstones are deteriorating and have suffered damage by stock over the years. "Known variously as Sanford's House, the Lynton Homestead and the Governor's Residence, Captain H.A. Sanford, the supervisor of the convict depot had an elegant, two-storeyed house built for himself in 1853. The date is carved into the keystone above the main doorway. Set against the side of a limestone hill, it was positioned in the sheltered lee of a breakaway, overlooking the valley and the distant sea at the mouth of the Hutt River. Lynton, the name given to Sanford's residence, was named after a small English village in Upper Tooting, Surrey. Like the buildings of the hiring depot, the house was built of faced limestone. Although parts of old ships masts were used for the balcony and veranda posts of the homestead, other timber had to be transported from Fremantle. (Trenaman, p. 13). The house was built with no inner staircase - steps outside led up to the higher level. Nearby Sanford had a circular stone mill and a large barn erected. The convict arrow, cut into the stone high on the eastern wall of the barn, suggests that it was convict built. However other sources claim that the arrow was a later addition carved by T.P. Crothers during repairs to the barn in the 1920s." For more detailed information check out http://inherit.stateheritage.wa.gov.au/Public/Inventory/PrintSingleRecord/f9e357a6-b08a-4e86-a82d-775599141bc3. The Hutt Lagoon, which lies just behind the town and covers 70 square kilometres, is a remarkable pink lagoon which is coloured by the presence of algae known dunaliella salina, a bacteria which lives in the salt lake and is the source of the beta caratine which is extracted from the waters. The colour of the lake changes from red to pink to lilac, depending on the time of day, time of year and the cloud cover. The ideal conditions occur during mid-morning or sunset on a sunny day. The lake is mined both for its salt and for its food colouring properties. It is possible to fish from the beach, jetty or boat for whiting, tailor, mulloway, snapper, coral trout, dhufish, bluebone or trawl for mackerel. It is also possible to see squid and stingrays from the jetty and whales and dolphins travel up and down the coast. The area between the reef and the beach is also excellent for snorkelling. Located north-east of Port Gregory via Yerina Spring Road and Ogilvie Road West (there is a map which can be downloaded at http://www.principality-hutt-river.com/visitors/PHR%20Location%20Map.jpg) is the famous Hutt River Province, the home of Prince Leonard and Princess Shirley of Hutt. This amusing episode in Australian eccentricity resulted when Prince Leonard renamed his wheat farm the Hutt River Province, declared himself a prince and his wife a princess, seceded from Australia and Western Australia and, as a nice little earner, started printing his own stamps. Of course none of his grandiose ambitions had any validity but he did attract an inordinate amount of publicity. They now have a wide range of souvenirs and encourage visits. Check out http://www.principality-hutt-river.com/for details. * Prior to the arrival of Europeans the area was home to the Nhanta (Nanda) Aborigines. * The first European to pass through the area was George Grey who, after his abortive attempt to explore the coast north of North–West Cape, was forced to walk back to Perth through the area in 1839. * Grey reported the existence of the Hutt River (both the Hutt River and Hutt Lagoon were named by Grey after William Hutt, the brother of the Governor of Western Australia) and in 1841 a government expedition was sent to explore the area. The expedition could not cross the Hutt River sandbars and so they sailed north to a site near modern day Port Gregory. * Another exploration party arrived in the area in 1847 and reported favourably on the pastoral potential. * In 1848 the explorer A.C. Gregory discovered lead ore in the Murchison River. * On 22 May 1853 F.T. Gregory and Captain J. Johnson sailed into the Port Gregory harbour with 60 ticket of leave men. The plan was to hire the convicts to local pastoralists. Johnson’s brig Leanderran aground and had to be abandoned. * A townsite was gazetted in 1854. * Between 1853-1867 six vessels were wrecked on the reef. * By 1856 the ticket-of-leave depot had closed down. * In 1943 the port was attacked by a Japanese submarine. * In 1967 the town changed its name to Gregory. There is no official visitor information centre. The closest are the Northampton Visitor Centre, 202 Hampton Road, Northampton, tel: (08) 9934 1488 and the Geraldton Visitor Centre, 246 Marine Terrace, Geraldton, tel: 1800 847 484. Port Gregory Caravan Park, 13 Sanford Street, Gregory, tel: (08) 9935 1052. There is a useful local area website. Check out https://www.australiascoralcoast.com. Boats at the port protected by the offshore reef.